Australian police have filed charges of dangerous driving against a 24-year-old Singaporean man who was at the wheel of a car involved in a head-on collision in which two of his four Singaporean passengers were critically injured. A spokesman for Victoria police told The Straits Times yesterday that the man, who was not named, faces two counts of dangerous driving causing serious injury and two counts of negligent driving. The accident occurred on Tuesday at 4.20pm at the Wonwondah-Dadswell Bridge Road and Northern Grampians Road intersection near the Grampians National Park, a tourist destination about 300km north-west of Melbourne. Two of the three passengers in the back seat, both women in their early 20s, were flown to Melbourne for treatment. One suffered head, chest and spinal injuries and was taken to the Alfred Hospital, which confirmed to The Straits Times yesterday that she was in a "critical but stable" condition. The other remains in a serious condition, with head and leg injuries, at Royal Melbourne Hospital. 1 When you apply for an international driving licence, read up on the driving laws of the country you are going to and prepare yourself for different terrains. 2 Take along a spare phone, extra batteries or a phone charger in case you are trapped after an accident. 3 Avoid driving in difficult weather conditions as the unfamiliar roads may put you in extra danger. 4 Inform someone at the hotel you are staying in when you will be back, if you are leaving for more than a day. 5 Plan your driving routes before you leave, or rent a Global Positioning System device to help you tackle new routes. 6 Contact the nearest Singapore consular authorities as soon as possible after an accident. They will help you overcome language and administrative barriers. 7 Do buy travel insurance as this will help you with medical and other costs in the event of a serious road accident. A third woman seated in the rear was taken to hospital with neck and back injuries. The driver and his front-seat passenger were slightly injured but not hospitalised. Singapore's Ministry of Foreign Affairs (MFA) said they and the Singapore High Commission in Canberra are in contact with the passengers and their next of kin. "The High Commission has sent officers to Melbourne to provide consular assistance to the Singaporeans," said an MFA spokesman. Police said the Singaporean driver will appear in Horsham Magistrates' court on Aug 24 and faces a possible prison sentence. The driver of the other car was reportedly a 24-year-old local woman, who was not injured and not charged. The Straits Times was told yesterday that the Singaporean driver failed to give way as required while approaching the intersection. The Victorian state government's roads authority will meet on Monday officials from the local Horsham Rural City Council to review the intersection, as it was the scene of another recent accident and is regarded as notoriously dangerous. The council's director of technical services, Mr John Martin, told The Straits Times yesterday that the roads were well marked with "Give way" signs but that the council had decided to erect bigger signs following claims that "there have been a history of incidents". A resident who uses the intersection daily, Ms Erin Mellington, told the Wimmera-Mail Times: "Something needs to be done fast. "I think the problem is the low visibility… Every close call I have had has been with foreigners who stopped to look at the alpaca farm on the side of the road, or truck drivers who think it is just a country road and won't be busy." The accident is the latest in a series that Singaporeans have been charged in connection with while driving abroad. In November last year, Singaporean Lew Wei Kiong crossed a double yellow line on a New Zealand highway to overtake other vehicles, crashing into two cars and a motorcycle travelling in the opposite direction. Five people were injured and the motorcyclist was killed. Lew was convicted of aggravated careless driving causing death and will be sentenced next Friday. In October 2014, Singapore Airlines pilot Benjamin Wu Yonghao, 32, was ordered to pay NZ$10,000 (S$9,200) each to two colleagues seriously injured in a crash in New Zealand, and banned from driving there for 18 months, after he ran a stop sign. 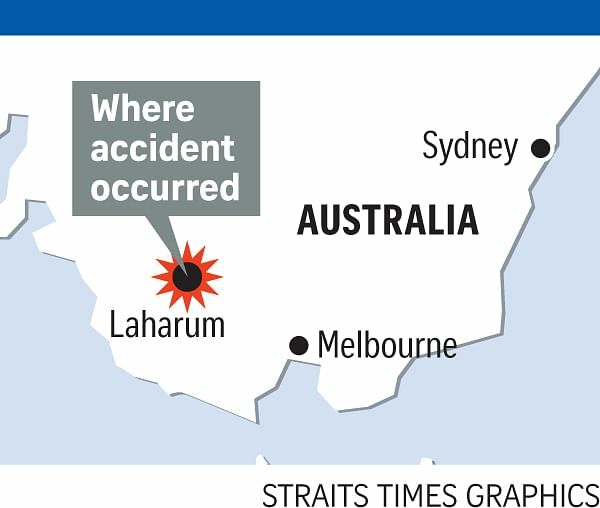 In November 2013, a Singaporean man was charged with dangerous driving when the car he was driving in Western Australia veered off the road and flipped over, leaving a 35-year-old Singaporean woman seriously injured.